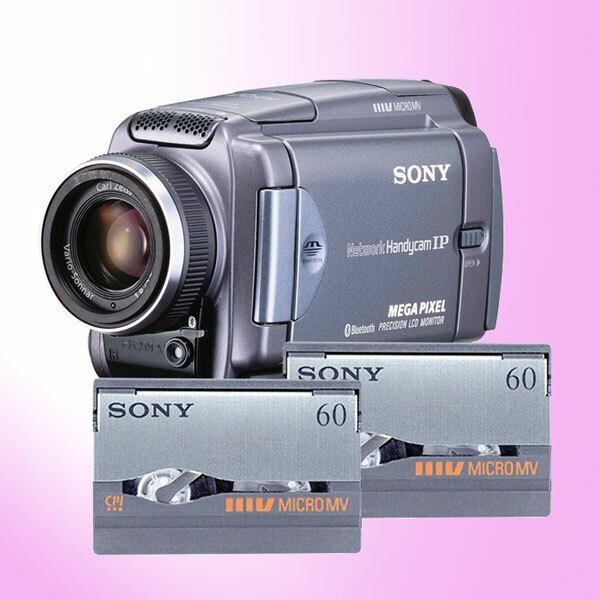 We transfer, copy and convert camcorder Sony MicroMV video tapes to DVD and Editable File Formats. MicroMV was one of the last analogue video tape formats to be manufactured. It was introduced by Sony and was phased out around 2006 as superior digital formats became available such as MiniDV, DVCAM and Panasonic's DVCpro. Our London studios can transfer your MicroMV video tapes to DVD or digital files for editing, efficiency and affordably while maintaining the up most quality. If you have have a stash of MicroMV tapes and no camcorder to play them on, get them to us without delay. All magnetic analogue degrades over time so it is better to get them transferred sooner rather than later. Don’t miss this chance to transfer your favourite video moments to DVD before you lose them altogether. Our equipment and working methods are cutting edge and nothing less than professional. Our knowledgeable staff do all work on site and monitor the transfer process from beginning to end ensuring that the colours are right, the resolution is clear, and nothing is ever lost. Don’t let your memories and favourite home movies fade with time. Get you MicroMV tapes copied to DVD TODAY. Broken and damaged MicroMV video tapes can be repaired. Send your broken MicroMV tapes to us for repair. We can fix the outer cassette housing if this is cracked or has parts missing. We can also fix snapped, creased, mangled and chewed up tape. PAL (UK) recorded video will need be converted TO NTSC for use in countries such as Japan and USA. Sony MicroMV video tape transfer to computer editable AVI files and MP4 files for iPad and iPhone. Some of our customers require editable files from their MicroMV tapes for editing on a PC or MAC. We normally supply uncompressed AVI files which can play on all computer systems. Uncompressed AVI computer files can easily be converted into any digital file format such as 8-bit or 10-bit Uncompressed Quicktime YUV or RGB, Apple Quicktime DV-MOV, DPX, Microsoft DV-AVI, Apple ProRes422, DVCPRO 50 or DVCPRO 25. We can supply these at cost. MicroMV video transfer to DVD costs £20 per tape. We normally like 5-10 days to turn work around There is a 24 hour rush service is available for 50% extra.